Today, I will continue to introduce about Food for Lunar New Year in Vietnam for your guys. I will tell some specific Traditional Vietnamese Food in 2 left areas in my beautiful country. They are Middle and Southern Areas. Hope you guys will not miss a chance to taste it when visit Vietnam in these days. 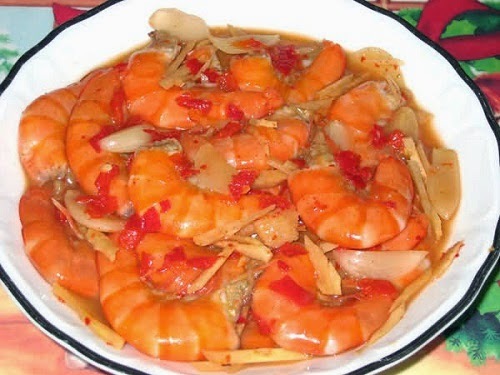 Sour shrimp is selling widely around in not only Vietnam but also some country like Thailand. However, Huế’s sour shrimp is the best Traditional Vietnamese Food. 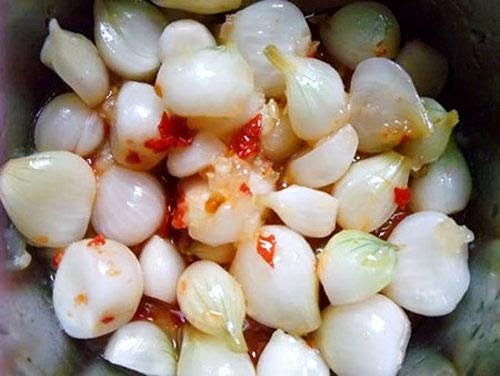 In just one food, you can taste the sweet fleshy of shrimp, the fat and delicious of meat, spicy of chili, garlic, sour of star fruit and wine of banana. All of it will bring the Tết’s flavor to you. The making of this food is quite difficult, so I suggest the best way is go to the supermarket and buy one. This Traditional Vietnamese Food is an unforgettable food of southern residents. It is more delicious if you eat it with stewed meat or girdled-cake. 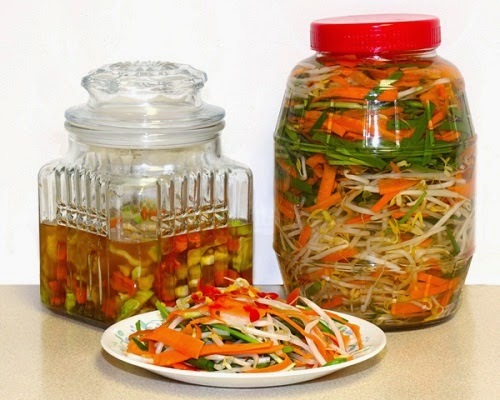 In Luna New Year’s Day, every food is fatty and oily, so pickled bean sprouts are a food that balances them. You can buy pickled scallion heads everywhere like supermarket, store, but I think making it by yourself is better. Firstly, mashing it in the ash water for one night, next clean and take away the roots and leaves. Then, drying them for next 4 hours and then chilling it with sugar. Finally put them in the pot for next 10 days. To make them is more colorful and beautiful; you can add some dried carrot. To sum up, from north to south, each area has their own specific food which can not replace. The people who lives in these areas can not forget flavor of Traditional Vietnamese Food when you live apart, even in another countries. They try to find them for eating, especially in Tet Holiday when every members in family has a chance to see and share everything together.